FRAN-DAN BOLT & SCREW CORPORATION first opened its doors in Inman Square, Cambridge, Massachusetts in 1939. Over time and with the fierce expansion of business, the company's growth mandated that a larger space was needed. 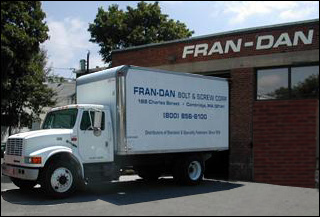 In 1963, FRAN-DAN relocated to its current location, a 25,000 square foot facility in East Cambridge. Recent growth has necessitated renovation of the offices and expansion of the warehouse, making it a state-of-the art distribution facility. The current distribution and office space allows us to serve our customers more efficiently, carrying an even more comprehensive and complete inventory, meeting the needs of customers locally, regionally and nationally.